Click here to see super-size! 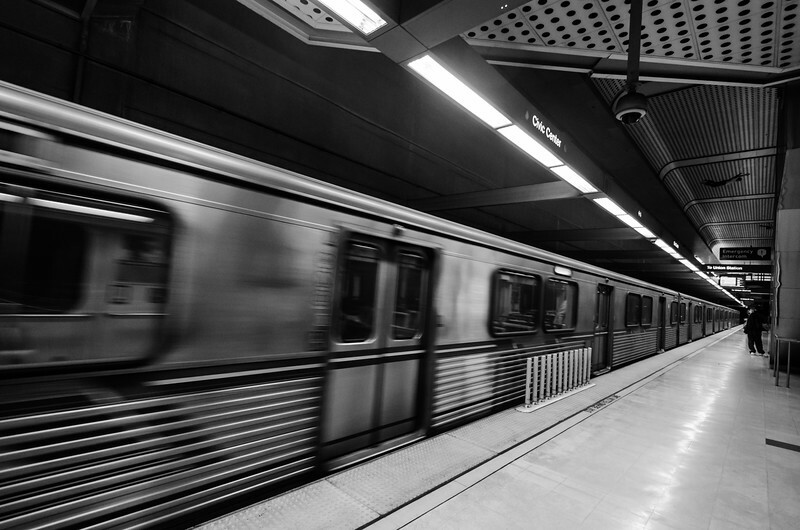 Here's one I took for work last week -- the subway pulling into the Civic Center station in downtown L.A. Yeah, go ahead -- insert your joke here about transit and traffic in L.A. I can take it! I used my Nikon 10-24 wide angle lens and opened it up all the way to 10mm to see what an approaching train might look like, suspecting there'd be some neat lines. There wasn't a lot of color in the original, so I converted it to black and white and bumped up the clarity. Check out more of my work on my SmugMug site, where all sorts of prints and other merch is for sale. I'm a whore: you want it, I'll sell it! This photo ©Steve Hymon and may not be used in any media elsewhere without advance permission from Steve Hymon. All rights reserved. Sammy loves his Lightroom preset!